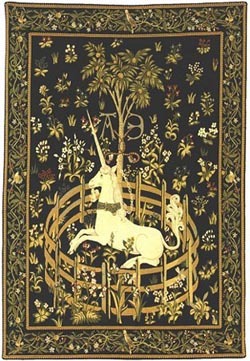 Home: Tapestries: The Unicorn Tapestries: Unicorn in Captivity: Unicorn in Captivity - 56" x 40"
Unicorn in Captivity - 56" x 40"
Jacquard woven in Belgium. Fully lined & finished with tapestry rod sleeve. Measures 56" x 40".